Bonney Forge is committed to keeping you up to date with the latest in forging technology, new product introductions and trade show appearances. Visit this page often for the most current information. If you are from the media and need additional information, please call 1-800-345-7546 or e-mail at newsroom@bonneyforge.com. MOUNT UNION, PA, December 19, 2014 ─ Bonney Forge Corporation, a leading international manufacturer of industrial forged steel valves, cast steel valves, forged steel fittings, unions and branch connections, is 40 years ahead of the phosphate-coating requirements the ASTM only recently issued in its updated 2014 version of A961. Specifically, the ASTM’s newest standard requires manufacturers to furnish carbon and low and intermediate alloy steel materials—for flanges, fittings and valves—with a corrosion-protective coating. The requirements of the new standard are effective immediately. “Bonney Forge maintains a long history of trailblazing manufacturing practices that exceed industry standards,” said John Leone, Chairman and CEO. Bonney Forge set the bar for the newest ASTM A961 requirement four decades ago with phosphate coatings, while many low-cost manufacturers have been applying an inferior surface protectant that includes an oil dip or residual cutting oils (previously applied during machining steps). The updated ASTM A961 requirements will no longer permit these inadequate practices. 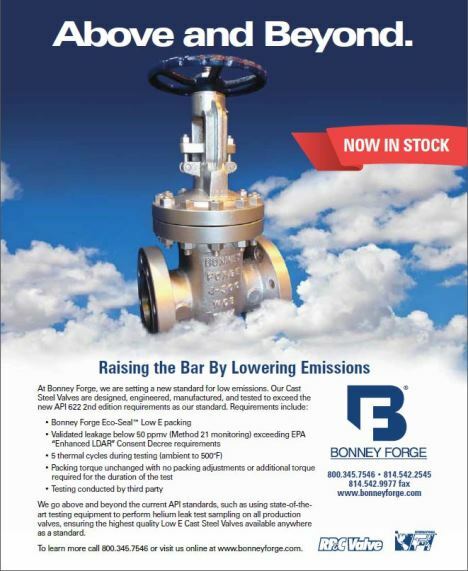 The key benefits of Bonney Forge’s phosphate coatings on carbon and alloy steel valves and fittings include an increased indoor shelf life and extended outdoor atmospheric corrosion protection. “Without this protective coating, products can corrode very quickly—sometimes in just a matter of hours, especially in humid or wet locations” says Paul Heald, Vice President of Product Engineering & China Operations. In addition, phosphate coatings preclude a potential safety hazard with oil. “Oil residue can drip onto the floor creating a slip hazard, and cardboard boxes can lose rigidity creating the potential for fittings tearing through and falling onto personnel carrying the items” said Heald. “Because we set the highest manufacturing standards with our customers in mind, they have, and will continue to benefit from our vigilance and commitment to excellence.” Please refer to our Bonney Forge technical letters for more on phosphate coatings: click here for condensed and comprehensive versions. Founded in 1876, Bonney Forge Corporation is a manufacturer and marketer of world-class, high quality forged steel fittings and unions, forged steel valves, cast steel valves and specialty products utilized in challenging operating conditions and environments. Bonney Forge serves multinational companies in the oil and gas, petrochemical, power generation, chemical manufacturing and general industrial piping industries. Bonney Forge, headquartered in Mount Union, PA, has fully-integrated forged steel fitting and valve manufacturing facilities. The Company owns WFI International, located in Houston, TX, which is a fully-integrated manufacturing operation specializing in made-to-order fittings and engineered piping components. 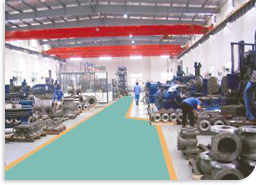 Bonney Forge’s international operation, Bonney Forge Shanghai is a wholly-owned foreign enterprise and manufactures cast steel valves. A year since regaining control of BFE by the American multinational Bonney Forge, the Albano valve company in the energy sector, grows its revenues and workforce. Go Bonney Forge Go. A little more than a year since returning to complete American control under Bonney Forge Co., a multinational with offices in Mount Union (Pennsylvania), BFE a company from Albano Sant’Alessandro, specialized in the production of valves for the energy and petrochemical sector, is growing: its revenues, employment, manufacturing facilities, and investments. The growth of the company – specialized in particular in the production of forged steel valves, valves in cast steel and niche products is also strengthening its human resources. 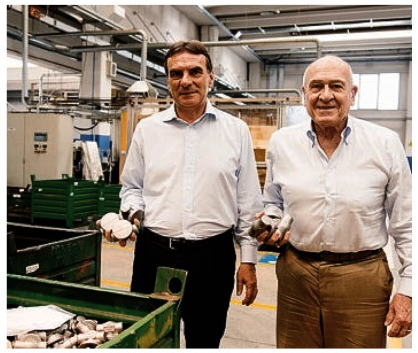 “Currently, continues Sonzogni- the group has 265 employees, of which 241 work in Albano. The rest are employed at our other location in Bosisio Parini (in the province of Lecco) where forging is done for the manufacture of valves. Last year, we employed 20 new staff, primarily technicians and specialized operators. Another 13 are planned for this year, 9 of which in Albano, and even new administration positions. It’s precisely on Arab countries where BFE, the groups branch, is focusing. Margaret Wilma “Willie” Leone, beloved wife, mother, and Nana, passed peacefully Monday afternoon at St. Luke’s Hospital in Bethlehem, Pennsylvania. She was surrounded by those who continue to love her most, her family. Willie was born in Winnipeg, Manitoba, Canada, on September 3, 1935. She was the younger of two daughters of Margaret (née Bell) and William Cunningham. Her sister, Isabel, was 14 years her senior. She and Willie loved each other deeply. Willie became involved with figure skating early in her life. She earned her nickname as a young woman, while performing across the country with the Ice Follies. She was a graceful skater, known for her bright spirit. The Ice Follies also brought her to Pittsburgh, PA, where she met her husband, John A. Leone. He was the love of her life. John and Willie were married in April 1956 in Bay City, Michigan. Together they raised a family of four children, John Richard, Susan Anne, Elizabeth, and Jennifer. Throughout their lives, they lived in many different places, including Pennsylvania, Venezuela, Illinois, Belgium, and Michigan. Willie made many dear friends and served as a gracious hostess everywhere she went. The Leones settled into their current home on Saucon Valley Road in 1984, but continued to travel the world together. Willie was an important source of strength for John as he advanced in his career as a petroleum engineer and entrepreneur. She believed in him intensely, giving him the confidence to succeed. With Willie’s support, John eventually acquired Bonney Forge Corp, which has manufacturing operations in Mt. Union, PA, Houston, TX, Bergamo, Italy, and Shanghai, China. She also fully supported the family’s considerable philanthropy. Willie is preceded in death by her eldest son, Rick Leone. She is survived by her husband, her children, Susan Leone, Elizabeth Almer, and Jennifer Slayton, sons-in-law Alan Svaboda, Charles Almer, and Mark Slayton, and her six grandchildren, Ellia, Kelsey, and Maddie Almer and Alyssa, Brett, and Elaina Slayton. They each have warm memories of her constant poise, sincere guidance, and quick wit, but most of all her fierce devotion to her family. A memorial service will be held on Tuesday July 2nd at 11 am, at Church of the Assumption of the Blessed Virgin Mary in Bethlehem, PA, with a reception to follow at Saucon Valley Country Club. Another service will be held on Friday July 5th at 11 am, at St Catherine of Siena Church in Mount Union, PA, with a reception to follow at the Bonney Forge Lodge. In lieu of flowers, donations may be sent to the Alzheimer’s Association, the American Lung Association, The Grier School for girls, or the Pennsylvania State University College of Arts and Architecture Willie Leone endowed scholarship fund in music and dance. 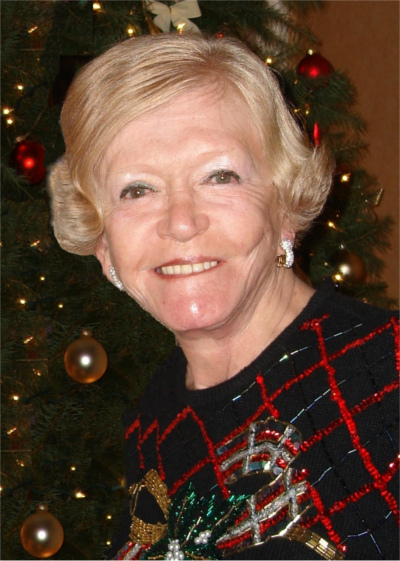 Bonney Forge Corporation sadly announces the sudden passing of Mrs. Margaret Willie Leone. She became very ill and was hospitalized over this weekend and then peacefully passed into eternal rest today. Born September 3, 1935, Willie Leone was 77 years old. Margaret Willie Leone (Cunningham), was the wife of John A. Leone our President and CEO and the love of his life. They were loving partners in life for over 57 years. Willie was not only John Leone’s princess and partner in life but she was also known for being an Ice Follies Princess in her earlier days. Willie was the Leone Family Matriarch and she was known for her constant grace, love, and determination throughout her life both in good and bad times alike. She possessed a deep and abiding love for all of her family, was considered a great mother by her children, and a special grandparent who unconditionally loved all of her grandchildren. Willie was the consummate host, a beloved and valued friend to all of us here at Bonney Forge/WFI/BFE and wherever she traveled. She will be greatly missed by each of us. We would solicit your sympathy, thoughts and fervent prayers for all of those in the Leone Family. Please understand that at the present time we do not have full understanding of the plans or details for memorial services and ask that you reserve contributions or flowers for a later time. We expect many of our Bonney Forge family and friends will want to attend memorial services and we will keep you apprised of the details as they become available. We regretfully announce today the passing of Mr. Fred Gilly, a key Bonney Forge, Engineering consultant who during his career held several important positions within our organization. He was an ever present asset to engineering, always Bonney Forge to the core and he represented the company on many boards including the MSS Conference. Fred had an amazing lifetime, 67 year relationship with the Bonney Forge organization and started that connection with us before many of us were even born, on June 19, 1946. Fred was 83 years young, born on September 20, 1929. Although he will be sorely missed, he will not be forgotten and we all mourn his passing. Bonney Forge Corporation Has Acquired BFE S.p.A.
-- Bonney Forge Corporation, a leading international manufacturer and marketer of industrial forged steel valves, cast steel valves, forged steel fittings, unions and branch connections, announced today that it has completed the acquisition of BFE S.p.A., an Italian manufacturer of industrial valves for applications primarily in the oil and gas industries, from Pegaso S.p.A., a subsidiary of Acciaierie Valbruna S.p.A. (the “Seller”). 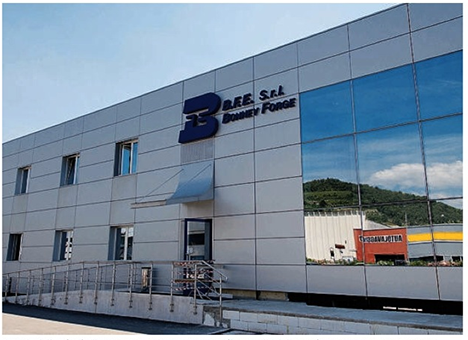 Established in 1957 and headquartered in Albano Sant’Alessandro (Bergamo, Lombardy), BFE S.p.A. specializes in the design, development and manufacture of a comprehensive range of industrial valves for applications in the oil and gas, chemical, petrochemical and power industries. 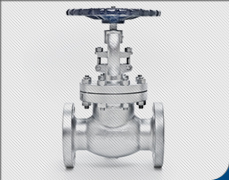 BFE’s product portfolio encompasses forged steel valves, API 6A valves, ball valves, cast steel valves, and pressure seal valves. 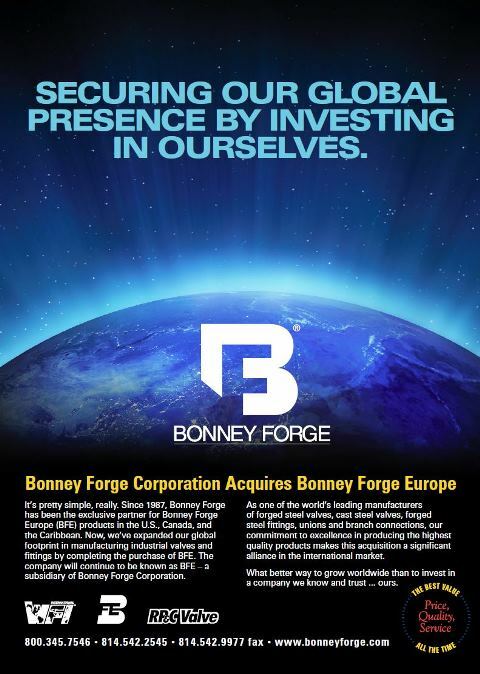 Since 1987, BFE has held an exclusive license agreement to use the Bonney Forge trademark in markets outside of North America, and Bonney Forge has been the exclusive sales and marketing agent for BFE products in the U.S., Canada, and the Caribbean. BFE was acquired in a cash transaction. Other terms of the acquisition are not disclosed. Wells Fargo Securities, LLC acted as exclusive financial advisor to Bonney Forge. Lazard & Co. and UniCredit S.p.A acted as financial advisors to the Seller. Founded in 1876, Bonney Forge Corporation is a manufacturer and marketer of world-class, high quality forged steel fittings and unions, forged steel valves, cast steel valves and specialty products utilized in challenging operating environments. Bonney Forge serves multinational companies in the oil and gas, petrochemical, power generation, chemical manufacturing and general industrial piping industries. Bonney Forge, headquartered in Mount Union, PA, has a fully-integrated forged steel fitting and valve manufacturing facilities. The Company owns WFI International, located in Houston, TX, which is a fully-integrated manufacturing operation specializing in made-to-order o-let fittings and engineered piping components. Bonney Forge’s international operation, Bonney Forge Shanghai, is a wholly-owned foreign enterprise and manufactures cast steel valves. 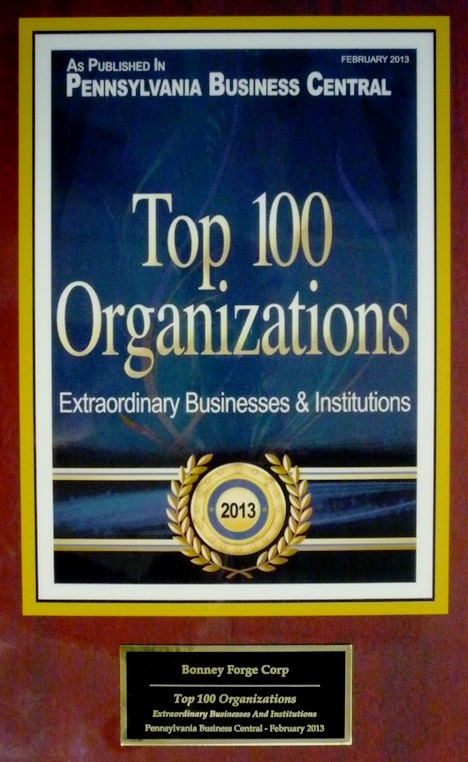 Bonney Forge has been named to the 2012 Top 100 Organizations list by the editorial board of Pennsylvania Business Central. Nominations were taken from throughout the publication's 20-county coverage area, and the final honorees were businesses that achieved a level of excellence, and had a positive impact on the region in 2012. Bonney Forge was among 65,000 eligible candidates. 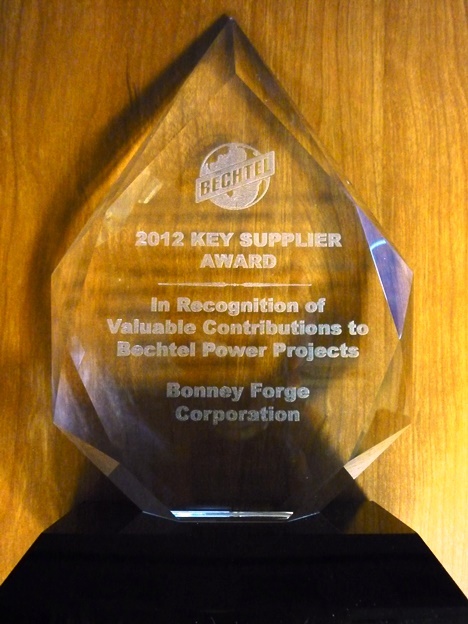 Bonney Forge Corporation was proud to be recognized for the Bechtel Power Corporation 2012 Key Supplier Award. 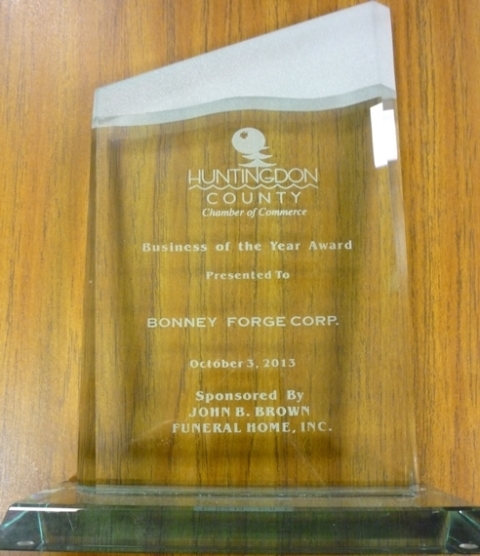 Bonney Forge was honored for its valuable contributions made to Bechtel Power projects in 2012. This award recognizes outstanding supplier and subcontractor performance on an annual basis. The best price, quality, and service for our customers. It's what we do and we are honored to be recognized for it. On April 24, 2012 Bonney Forge Corporation was proud to be recognized for the Bechtel Power Corporation 2011 Key Supplier Award. Bonney Forge was honored for its valuable contributions made to Bechtel Power projects in 2011. This award recognizes outstanding supplier and subcontractor performance on an annual basis. The dinner and award ceremony was held at the Ceresville Mansion near Bechtel headquarters Frederick, Maryland. Mount Union PA.----Bonney Forge Corporation regrets to announce the passing of J. Rick Leone, the Company's Executive Vice President, April 16, 2012. A 27-year employee of Bonney Forge, Mr. Rick Leone was in Atlanta, Georgia at the time of his passing. During his career, he held several senior positions at Bonney Forge in a number of functional areas within the organization. Bonney Forge representatives said, "We are saddened to announce the unexpected passing of Rick who was an integral member of the Bonney Family. Rick served Bonney Forge with distinction in positions of increasing responsibility spanning nearly three decades. He was a substantial contributor to the growth in the Company from its humble beginnings to the world class operation it is today. "For many years at Bonney Forge, we have spoken of the Bonney Family Spirit, and Rick truly exemplified that Family Spirit in every aspect of his life. He was a special member of the BF family who served as an industry leader, a mentor and a role model for many within the Company. Although he will be missed, he will not be forgotten as his legacy will live on in those he has prepared for the future. We mourn his passing and will miss his dedication, his expertise and the bond of friendship he had with each of our employees. Our thoughts and prayers are with the Leone family." With manufacturing facilities in the United States and abroad, Bonney Forge serves as the primary resource for the power, oil, gas, chemical, marine and construction industries worldwide. 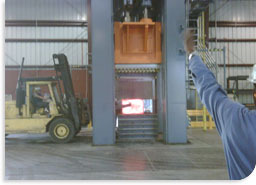 Bonney Forge, a leading manufacturer and supplier of branch connections, fittings and unions, cast steel valves and forged steel valves as well as specialty products, and WFI International, which manufactures branch connections, engineered-to-order, and nuclear products, now offers customers online access to mill test reports which include the Original Steel Mill and Foundry Certificate for every product. By sharing the original Steel Mill and Foundry Certificate on every MTR, Bonney Forge and WFI raises the bar for quality assurance industry wide. In addition to the origin of the raw material, MTRs include chemical analysis, mechanical properties, and quality accordances. “ With this certification, we guarantee customers that we use the highest quality materials available to ensure unsurpassed product performance, every time, ” said Leone. Established in 1876, and headquartered in Mt. Union, PA., Bonney Forge is recognized as a global leader in the marketing and manufacturing of branch connections, fittings and unions, cast steel valves and forged steel valves as well as specialty products. For more than a century, Bonney Forge has achieved manufacturing excellence through detailed attention to customers’ needs and producing consistently superior flow control products. With manufacturing facilities located in the United States and abroad, Bonney Forge serves as the primary resource for the power, oil, gas, chemical, marine, and construction industries worldwide. WFI International is located in Houston, TX and operates in a 101,500 sq. ft. fully integrated manufacturing facility that supplies commodity branch connections and specializes in engineered-to-order, and nuclear products. To learn more about WFI International and to access our online MTRs, visit wfi-intl.com. For more information about Bonney Forge call 800-231-0655 or visit our website at www.bonneyforge.com. 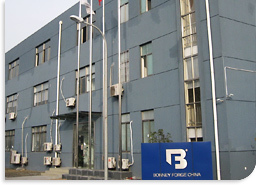 Bonney Forge China, our cast steel valve manufacturing subsidiary in Shanghai, China has completed the change of its legal name to Bonney Forge Shanghai Limited. The company continues to produce a high quality line of cast steel gate, globe and check valves at its plant in the Qingpu Industrial District of Shanghai. 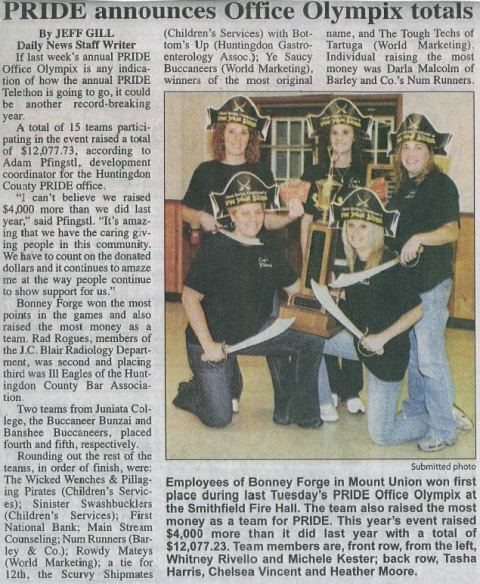 Team Bonney Forge recently took part in the Huntingdon County PRIDE Office Olympix. Team members were required to compete against other Huntingdon County businesses in indoor carnival games. Not only did Team Bonney reign supreme in event points, they also were recognized for raising more money than all competing orginizations. All funds raised will be donated to PRIDE programs which provide for developmentally and/or physically disabled Huntingdon County residents. University Park, Pa. – John and Willie Leone have committed to endow the Department of Energy and Mineral Engineering in Penn State's College of Earth and Mineral Sciences with a leadership gift of $5 million. 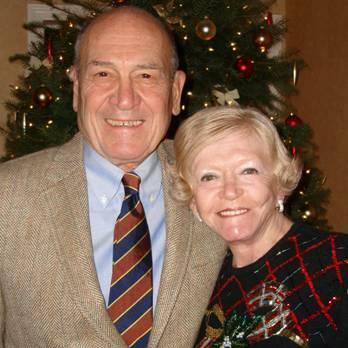 The University will name the department in recognition of the couple's generosity. The gift is the largest from an individual or couple in the history of the College of Earth and Mineral Sciences, and will enable the John and Willie Leone Family Department of Energy and Mineral Engineering to create such opportunities as a faculty chair, undergraduate scholarships and graduate fellowships. John Leone is president and chief executive officer of Bonney Forge, with manufacturing operations in Mount Union, Pa.; Houston, Texas; Shanghai, China; and Bergamo, Italy. Bonney Forge, founded in 1876, is an industry leader in marketing and manufacturing forged steel fittings and unions, branch connections, forged steel valves, cast steel valves and specialty engineered products for the energy industries. “We are pleased to make this commitment, which provides a foundation for a program in the college, integrating engineering and business disciplines," said John Leone. "I’m confident that graduates of this program will possess distinctive skills that will benefit their careers, industry and the University." John Leone graduated in 1956 from Penn State's petroleum and natural gas engineering program and earned an MBA from Northern Illinois University in 1976. He is a life member of the American Society of Mechanical Engineers and a Pipe Valves and Fittings Industry Hall of Fame honoree. At Penn State, he was named an Earth and Mineral Sciences Centennial Fellow in 1996, a recipient of the C. Drew Stahl Distinguished Achievement Award in Petroleum and Natural Gas Engineering in 2006, and a Penn State Alumni Fellow in 2008. Willie Leone is a former professional ice skater. The couple resides in Bethlehem, Pa. The Leones have a long history of supporting Penn State, dating from their first gift to the Department of Petroleum and Natural Gas Engineering in 1984. Their philanthropy includes gifts for undergraduate scholarships in petroleum and natural gas engineering, theatre and dance and Penn State athletics. The College of Arts and Architecture has an endowed scholarship, named for Willie Leone, that assists undergraduates majoring in musical theatre who are especially talented in the area of dance. The endowment for the John and Willie Leone Family Department of Energy and Mineral Engineering is part of a University-wide fundraising initiative, For the Future: The Campaign for Penn State Students, which officially kicked off in April. The campaign’s top priority is keeping a Penn State education accessible for students and families. For the Future is the most ambitious effort of its kind in Penn State’s history, with the goal of securing $2 billion by 2014. Bonney Forge has developed a mobile tester for assembled unions and in-process union components. The pneumatic cylinder pressure is set to duplicate the “minimum tightening torque requirement” for each size. Below are some of the advantages of this unit. "Just wanted to send a note regarding recent articles in Supply House Times by Joan Adams on “What’s Killing U.S. Manufacturers.” The central crux of Ms. Adams’ argument seems to be that American manufacturers are prone to long lead times because they don’t want to take the time to change out tooling to make more breadth of product. “Shorter runs and lightning response time” will lead our manufacturers out of stale thinking, according to the author. That and erasing the belief that American workers are slow and incapable. Presumably, the Chinese, who are an ocean away, have a more enlightened view of manufacturing and are therefore better able to respond to the needs of the industry than our homegrown American manufacturers and that’s what’s killing U.S. manufacturing. Untrue. Inaccurate. Irresponsible. Simplistic. Unprofessional. These are a few words that come to mind in assessing these articles (September and October issues). Question: Who did Ms. Adams interview for this article? Bonney Forge: Bonney’s forged steel fitting operation is among the finest in the world. They produce over 1,000 line items and can ship 90+% from stock. Their product is approved everywhere and their service is outstanding. Bonney is an industry leader. Boltex Mfg: Boltex has invested more in forging production and flange manufacturing than anyone in the world. Their product is on every approval list. They also produce close to 1,000 line items and ship 90% from stock. Boltex is an industry leader. Tube Forgings of America, Mills Ironworks, and Westbrook Manufacturing are a few other U.S. manufacturers that offer tremendous service, rapid response time, thousands of line items and 90% shipment from stock. All of these manufacturers are industry leaders that have embraced what Ms. Adams argues for — shorter runs, rapid response times and streamlined operations pulling the best from American workers. And I can buy every one of these products overseas at half the price. What Ms. Adams should focus her time and attention on is, how is it possible for foreign manufacturers to sell weld fittings, as an example, at a cost below what U.S. manufacturers pay for the pipe? Just wanted you to know the journalistic quality of these articles is far below the standards that I know you have for your fine magazine. I’ve cc’d some of these manufacturers so they know how I feel about their product and how proud I am to represent them. Bonney Forge has collaborated with the Pipe Fabrication Institute (PFI) to produce their 2008 Approved Release PFI Standard ES-49, “Guideline for Installation of Integrally Reinforced Branch Outlet Fittings”, which covers in detail the basic welding procedure and recommended weld deposit criteria for OLET® fittings. Additionally, a revision has been proposed to B31.1 “Power Piping Code” clarifying the governing criteria used for weld size determination and provides depictions of some acceptable weld profile for “Integrally Reinforced Branch Outlet Connections”. This proposal has favorably passed the sub-committee and is currently under ballot in B31.1 main committee. The approved revisions are Paragraph 127.4.8 and the addition of Figure 127.4 (G) showing acceptable details for integrally reinforced branch connections. This initial proposal consisted of the addition of Figure 127.4 (G), “Some Acceptable Details for Integrally Reinforced Branch Connections,” and the corresponding changes to paragraphs 104.3.1, 127.4.8 and 132.4.2, as well as the addition to paragraph 100.4.2 for the definition of an “Integrally Reinforced Branch Outlet Fitting”. These details have not previously been included in B31.1. The following ballot was issued with a closing date of February 25, 2009 and was approved in sub-committee. The following is the proposed and accepted changes in the ballot to the ASTM A105 specification: (Will be published in the next revision of A105. Any manufacturer not providing these new criteria is not in compliance with the ASTM A105 specification.) - See underlined below. 7.4.1 – Two hardness tests shall be made for each heat of as-forged components. 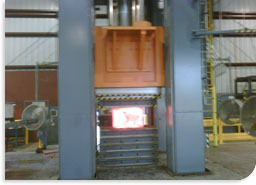 When more than one forging is produced from each heat, a minimum of two forgings shall be tested with one reading from each forging. When only one forging is produced, it shall be tested in two locations. 7.4.2 – Except when only one forging is produced, a minimum of two forgings shall be hardness tested per batch of continuous run as defined in 7.3.2.1 to ensure that forgings are within the hardness limits given in Table 2. When only one forging is produced, it shall be hardness tested in two locations to ensure it is within the hardness limits given in Table 2. Our new 16,500 sq. ft. 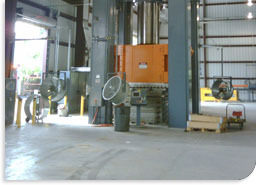 Forge Shop has become home to a recently installed new 3,000 Ton H Frame Hydraulic Press. 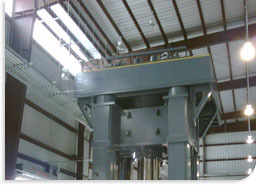 The Press Main Cylinder is 41 inch diameter and operates at up to a staggering 4550 psi. This new powerhouse is run by (4) 400 HP Electric Motors and Pumps using an oil reservoir of over 2,800 gallons. This new Press is complemented by a new 300 Ton Vertical Ring Mill that has increased our ring size capabilities of the new press. A four column frame design with moving bolster guide has up to 300 tons of roll forging capacity. These two new pieces of equipment are supplemented by a new Twin Bed Forge Furnace designed with the latest technologies and built to meet the needs of these larger capacity equipment material requirements. WFI has a commitment to growth aimed at meeting our customers needs. Bonney Forge is now requiring that our foundry sources control and report the Aluminum content on all valve castings used for our Cast Steel Valve product line. This new Aluminum limit, set at 0.06% maximum for WCB material, has been put in place to make sure that our Cast Steel Valve pressure retaining components have limited amounts of Aluminum in their chemical make-up, which is important as high levels of Aluminum has been shown to impair the mechanical strength of this material. Bonney Forge has implemented this new material requirement today on our own, prior to the implementation of any new requirements on this issue by the marketplace, reinforcing our commitment of providing the highest quality valve products to our customers every time. Concerning Aluminum Content only, not all MTR's will have this reported for stock prior to the implementation; only new casting purchases. Welcome to the new Bonney Forge website! Welcome to our new version of the Bonney Forge website. This updated rendering has been structured in a way that provides a more efficient and effective offering of the information and services that you require from our data base. Moreover it has been deliberately designed to provide the flexibility to quickly make changes or additions as required. We are confident that you will find, along with the new and cleaner look, a more friendly and simple way to access the features that you need. We also want to take this opportunity to express our gratitude to all the individuals in our industry that have contributed to this effort. Bonney Forge offers Original Steel Mill Certifications for viewing purposes which is now available through our on-line material test report system. 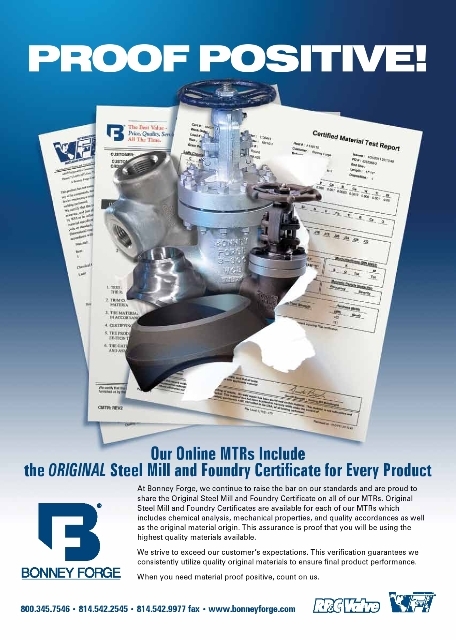 Customers can now view the original mill test report certifications for raw material lots when submitting requests for product MTRs on our website www.bonneyforge.com. This information is currently available for new product lots in the A105 material grade. To view a current certificate, simply enter the correct product and lot information and click submit: a link will display as follows if the mill certificate is included within our database. Click here for Original Steel Mill Certification. Since this is a new program, this link for the original test report may not appear for older product lots. In these cases, please contact your Bonney Forge Sales Representative if you wish to see the original test reports for material lots not included within this program. We hope you find this information useful and we strive to exceed our customer expectations and provide consistent quality starting materials to ensure final product performance. Bonney Forge has expanded its manufacturing capabilities to include stocking of low-alloy Forged Steel Fittings, Unions, and Branch Connections. These products are available in the same sizes as the carbon steel product line and are available in the following ASTM A182 material grades: F5, F9, F11, F22, and F91. Other Alloys, Stainless, and Exotic metals are also available on a made-to-order basis. The low-alloy steel product line will continue Bonney Forge’s commitment to meet customer demands for products suitable for harsh industrial environments, especially where improved corrosion resistance and increased strength at elevated temperatures is required. Bonney Forge’s Cast Steel product line continues to receive new major end-user approvals. Petro-Canada today approved the Bonney Forge Cast Steel product line for use at all of their facilities throughout Canada. This approval covers Bonney Forge Cast Carbon Steel Gate, Globe, and Check Valves in Sizes 2” to 24” and Pressure Classes 150 and 300. This approval was granted after Petro-Canada thoroughly reviewed Bonney Forge’s standard RP-591 Test Data along with supplemental Mechanical, Radiographic, and Non-Destructive test data specified by Petro-Canada that went above and beyond the standard RP-591 requirements. Bonney Forge’s Cast Steel Valve approval at Syncrude Canada was recently expanded to cover Carbon Steel Gate, Globe, and Check Valve products up to 24” in size in Pressure Classes 150 and 300. This approval extension was granted after Bonney Forge successfully completed extensive Mechanical, Radiographic, and Non-Destructive testing of large diameter Cast Steel Valve products performed by the Acuren Group (Calgary, Alberta) per the Syncrude L-37 Valve Qualification Specification. Syncrude Canada is the world's largest producer of synthetic crude oil from oil sands and is the largest single source oil producer in Canada. McJunkin Red Man, the largest industrial distributor of pipe, valves, and fittings in North America, has designated Bonney Forge Shanghai as an Approved Supplier to their organization. With this designation, all products produced at the Bonney Forge Shanghai facility (2” to 24” - Class 150#, 300#, 600# Cast Steel Gate, Globe, and Check Valves) are approved for inventory and sales by all of McJunkin Red Man’s 250 branches in the United States and Canada. Bonney Forge is pleased to announce that our Forged Steel Valve product has recently been approved by UOP for use in Hydrofluoric (HF) Alkylation Units that follow the UOP process license. This approval covers Bonney Forge ½” to 1 ½” Class 800 Bolted Bonnet OS&Y Gate Valves (UOP Pipe Classes HF-2 and HF-20) which have been specially configured for HF Acid service applications. UOP, based in Des Plaines, is the world’s largest provider of process technology to the refining and petrochemical industries. Their proprietary HF alkylation process is used by most major refiners to produce alkylate, which is an important ingredient in all of today’s clean burning fuels (commonly known as reformulated gasolines). Bonney Forge is currently undertaking one of the largest capital building and equipment expansion plans in the history of the company. One major “Building Block” to this aggressive plan is a 60,000 square foot valve warehouse that was completed in 2007. This “Green Field” building resides on a 19 acre site adjacent to our Mount Union manufacturing facilities. This expansion has freed up valuable factory floor space in the manufacturing facility for continued growth and investments in state of the art manufacturing equipment. This track of ground will also allow the continued expansion of facilities as required to support future growth. 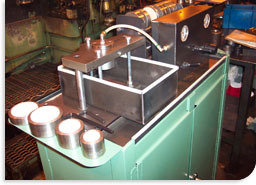 Recent major machine shop manufacturing equipment additions include a flexible CNC 9 Station 15 Spindle Transfer Machine capable of producing tees and elbows through the 2” NPT size range. A CNC Multiple Spindle Vertical Lathe to support our MTO fitting and valve manufacturing operations, four newly rebuilt Automatic Screw Machines to support our “Bar Products” fitting line, and a soon to be installed normalizing and Temper Heat Treatment complex. Additional CNC Multiple Station and Multiple Spindle Machines are currently under construction for installation in the second quarter of 2009. These new equipment purchases are aimed at improving manufacturing capabilities and capacities in all product families offered by Bonney Forge. A second “Building Block” to this investment plan is a 12,000 square foot forge shop expansion that is currently underway. This extension of the current forge facility will house two fully rebuilt Mechanical Forge Presses that will increase the forging capability and capacity of Bonney Forge. These two new forging cells will include the most modern billet heating equipment available in the marketplace. The Bonney Forge Mount Union Manufacturing Facilities are not alone in this investment commitment. WFI International in Houston Texas is also in the process of Major Facilities and Equipment expansions. WFI had recently acquired approx. 6 acres of property that adjoins the manufacturing facilities. This acquisition is allowing the current facilities to grow with our customers and our business without any interruption to our operations. A new 16,000 square foot forge shop is currently under contract and will be the home of a brand new 3,000 Ton Open Die Hydraulic Press. This new press has been designed and built to the exact specifications necessary for this unique manufacturing facility and product families. Included in this forging complex will be a state of the art Ring Roller and Billet Heating Equipment necessary to support the WFI product range. This forging operation is supported by the addition of newly added CNC Horizontal and Vertical Lathes as well as a new CNC Horizontal Boring Mill. These are just a few of the equipment investments made by Bonney Forge as a commitment to our customers and the industry. Bonney Forge is pleased to annouce that we have successfully completed the certification for our Cast Steel Valve product line to the testing, inspection, and quality assurance requirements outlined in the American Petroleum Institute's Process Valve Qualification Procedure RP-591. This qualification process, completed in conjunction with United Valve (Houston, Texas) was accomplished utilizing product produced by Bonney Forge Shanghai, located in Shanghai, China. Valves now qualified to RP-591 specifications include 2" to 12" ANSI Class 150, 300, 600 Gate, Globe, and Swing Check products. Bonney Forge Corporation is expanding again. John Leone, president and CEO announced that Bonney will expand the forge shop and office building. The forge shop will expand by approximately 12,000 square feet. Some of this space will be used to house two new mechanical presses in order to "improve productivity and expand the product line and increase forge capacity". Also planned is an addition to the corporate headquarters in Mount Union, PA which is projected to be completed in late 2009. Mr. Leone went on to state that this growth is in keeping with Bonney Forge’s history of commitments to it’s markets through cost effective investments. 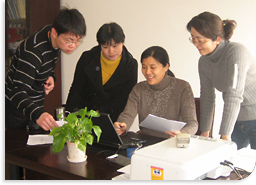 Bonney Forge Shanghai has moved to a larger location which allows us to better serve our customers. Our new facility is located at 1969 Huibin Road, Shanghai. This new site consists of new office space as well as two adjacent buildings which house our state-of-the-art assembly and manufacturing area. This new and larger facility will allow us to highlight our efficiency allowing cost savings as a direct impact. In looking toward the future, this move will allow for reinvestment in growth to serve our customers in all areas of price, quality and service.